While growing up has never been easy, today’s world undeniably presents kids and their parents with unprecedented challenges. 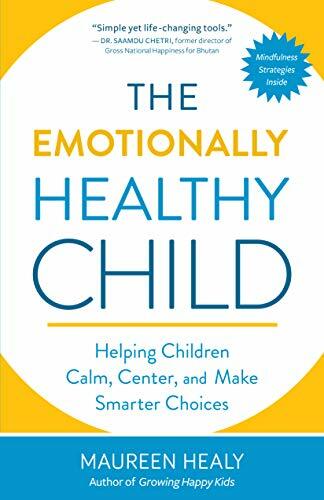 Award-winning author and international speaker Maureen Healy in Emotionally Healthy Child: Helping Your Child Calm, Center, and Make Smarter Choices is a widespread acknowledgment that emotional health, resilience, and equilibrium can be learned and strengthened. Healy, who was a “wild child” — the kind, she writes, who left babysitters “wondering if they wanted children” — knows her subject. She has become an expert on teaching skills that address the high sensitivity, big emotions, and hyper energy she herself experienced. In The Emotionally Healthy Child, Healy shows readers how to teach children to master their emotions and move forward on their unique paths toward wholeness by developing the mindset and habits necessary to be able to stop, calm, and make smarter choices. Healy gives adults the ideas and real-life strategies they need to raise emotionally healthy children. Her book delves deeply into what children need to know, what children need to do, and what speeds up the process of emotional health. It also includes a toolbox full of mindfulness tools designed to help readers put the ideas throughout the book into practice. When it comes to my children, I would do anything for them – I want to ensure that they know that they are loved, that they can accomplish anything they set their minds to, that I am proud of them and that I support them. I also want to ensure that they have the skills to cope in a world that can be unkind and ever-changing. Having suffered with mental health for years, I know how anxiety can creep in slowly and can destroy your confidence and self-worth. I still struggle to this day and have to find ways to calm my mind and emotions down. I worry that my children will pick up on this or even inherit some of this from myself and I want and need to prepare myself with the knowledge and tools to help them. I have had to learn not to be reactive but instead calm myself and understand the situation before dealing with the situation. All children have a hard time dealing with strong emotions, especially when they are placed in situations like preschool, daycare, school and even at home where they are not always in control. This book is not just for children who are struggling to handle their emotions but for all children regardless of age and their parents. Emotions are an everyday part of life and we all need to learn to recognize these emotions and learn how to control our actions. This is not just a skill for children but a skill that you will need your whole life. This book teaches you about identifying emotions and empowers you as a parent to help guide your child through them. Maureen points out common statements that we may make as a parent (which seem harmless) but to a child may be taken out of context and cause them to react further. We need to look past the superficial reason a child may be acting out and learn the whys behind their actions before we can help guide them through their emotions. Children may be labelled as “bad” but if we look at why they are acting out, we can help understand them, show them we care and guide them through it. I loved how she helped us learn each emotion and gave us helpful tips and tools on how to deal with a wide range of situations. Some of the tools I have implemented in my own work day (hand over heart and deep breathing), as well as downloading one of the suggested apps for my phone to help us as a family with mindfulness. I loved the wide range of quotes that she includes throughout the book (one of my favourite is at the top of this section) as it helps to put what we are learning into perspective in each chapter. This book is a must have parenting book – it is full of tools, tips and situations that prepare, guide and teach us how to handle a wide variety of situations. It not only will help you become a better parent in understanding your child but also assist you in becoming a better emotionally balanced parent. A win for both parties! Maureen Healy is the author of The Emotionally Healthy Child and also Growing Happy Kids, which won Nautilus and Readers’ Favorite book awards in 2014. A popular Psychology Today blogger and sought-after public speaker, Maureen runs a global mentoring program for elementary-aged children and works with parents and their children in her busy private practice. Her expertise in social and emotional learning has taken her all over the world, including working with Tibetan refugee children at the base of the Himalayas in Northern India to classrooms in Northern California. Visit her online at http://www.growinghappykids.com. What inspired you to write The Emotionally Healthy Child? Teaching children is my greatest joy. As I pondered the issues that many of the smart, capable kids I work with are facing — like stress, worry, fear, and trauma around bullying — I realized that the majority of children today lack the understanding of how emotions work and what their role is in creating happier ones – so that’s where the idea for the book was born. Originally, I was going to title the book, The How of Children’s Happiness but it became clear to me that focusing on the broader concept of emotional health would serve more adults, professionals and ultimately, children. How do you define an emotionally healthy child? Children are all in the process of learning who they are, and how they relate to their feelings. But the emotionally healthy child is doing something differently – she is learning to pause and release her emotions constructively even if they’re challenging like anger or jealousy. She no longer is operating solely on “automatic” but is gaining emotional self-control and awareness. This allows her to express their full range of emotions constructively, while honoring each moment (not running from or ignoring it) for whatever it is. In The Emotionally Healthy Child, you say that three simple steps have the power to change everything when it comes to emotional health. What are they and why are they important? The “Three Steps to Success” are: 1) Stop, 2) Calm, and 3) Make a Smart Choice. The first step is where children learn to catch themselves before they go in negative and challenging directions, so they stop. Then they calm, before moving on to step three, which is making a smart choice — that is good for them and others. For example, if they’re angry, they might yell and find some relief from their anger. This is good for them, but certainly not for others. But what if they took some deep breaths and walked away, this would be good for them and others, therefore a smart choice. As simple as these steps sound, they have the power to help children begin moving in a more constructive and emotionally healthier direction whether they’re feeling angry, frustrated, disappointed or worried. They apply to all emotions and are a theme throughout the book to help children slow down and make smarter choices, even when they are emotionally charged. The Emotionally Healthy Child is full of practical tools for parents, teachers and professionals to teach children about how to healthfully express their emotions. Can you share one of those tools with us? 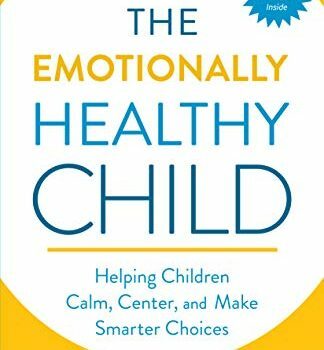 Yes, The Emotionally Healthy Child is full of practical strategies and tools to help children regain their emotional balance and make smarter choices. I will share one I call the “Smart Choices Checklist,” which helps children identify what smart choices are, and what they look like at home or school. For example, Joshua has trouble on the playground and hasn’t been making smart choices, so his teacher led his classroom in the creation of a smart choices checklist. Smart choices are defined as good for you and good for others. So instead of pushing children, Joshua identified several smart choices that he can make when he’s feeling frustrated such as: 1. Walk Away, 2. Use my Words, 3. Take Deep Breaths, and/or 4. Go to the Library. Before this discussion, Joshua wasn’t clear on what he could do when he’s frustrated, but now he goes to the library more and reads Mr. Underpants, which he loves. You emphasis the ability for children to learn how to make smarter choices even when emotionally challenged. Can you explain what a smart choice is? Smart choices are choices that good for you and good for others. Children that are emotionally reactive tend to have big emotions and start life releasing them in ways that aren’t smart choices like screaming and shouting. But once they learn how to stop, calm and make smarter choices, even big emotions don’t have to come out destructively. They can walk away from someone calling them names or take deep breaths, for example. These are smart choices.